If you’re not already setting schedules for yourself, working out is a great way to build that habit. What do Cher, Warren Buffet, and OKCupid founder, Christian Rudder, all have in common? While you might have guessed that they are professionals at the top of their game, it is not the only similarity. The truth is that they all have an even bigger commonality among them: they all work out, and they all consider it integral to their success. They are not the only ones, either. Entrepreneurs like Richard Branson (who has started over 400 companies) have long known that regular physical activity, be it running, lifting, or yoga, can provide you with up to four extra hours of productivity every day. It is no secret that Rhodes Scholars are amongst the most accomplished, organized, and successful people in the world. Why? The Rhodes Scholar program at Oxford’s University takes the sports accomplishments of their candidates’ as seriously as they take the academic ones. Graduates of the university have well balanced lives, being accomplished both in the intellect and in the physical. They are good habit machines! If you are not already setting schedules for yourself, working out is a great way to build that habit. Set time aside and give yourself goals you are actively working towards, whether it be losing weight or being able to run a certain distance. Practicing discipline as you workout and start seeing results will help you carry that into the office, creating professional checkpoints to work towards. Just do not get frustrated if you do not get the results you want right away. Results can take time. If you are looking for help, I go into this deeper in my book, Strong is the New Skinny. After a long day of work, it is tempting to crash in front of the TV and eat or drink your frustrations away. You worked hard and you may think you deserve it now, but have you asked yourself what you deserve in the long run? It can be hard to connect with your deeper needs when you are always working or distracted. Personally, I am susceptible to a lack of focus that makes me jump from one thing to another. I get easily distracted and fall prey to a lack of discipline. That is one of the best things about exercise: it puts your mind in contact with your body and makes them whole. Taking those few minutes out of your day to work out lets you do a rundown on what you really need, allows you to collect your thoughts, and instills a sense of direction instead of letting you indulge yourself. It is really the best way to break any destructive habits that stand in your way. It allows all the pressures of responsibility, and the desire for escape that goes with it, to slide away, replacing them with a one-on-one conversation with yourself. Knowledge is power, and knowing what you need makes you smarter, more resilient, and more able to create better habits moving forward. It is often publicized that many of the Fortune 500 and the most innovative companies in the world like Apple, Google, and even Deloitte have onsite exercise facilities. The reason is simple: making exercise easily accessible eliminates an excuse and encourages staff to use the facilities. In turn, this exercise makes everyone at the company sharper and more competitive, and therefore the company itself sharper and more competitive. Even “old world” companies like big banks and accounting firms are building exercise rooms into their new facilities because they know it leads to results. Work can be frustrating. You may be pushing yourself to do the best you can, but whether it is negative supervisors, gossipy co-workers, or just feeling stuck doing the same thing over and over again, it can be difficult to stay engaged at work when this feeling strikes. If you fall victim to this thinking, your career will suffer—so you will need to shake it up and find a way to relieve the stress. Regular exercise not only keeps you in the fight, but gets you working harder, better, and smarter. After all, if you want to be the best, you have to be your best self. So keep pushing yourself to climb and compete, both physically and mentally. As you do, you will see that the negative voices have less power. The naysayers will fall to the wayside as you regain control of your mood, your body, your career, and your life. Do not accept limitations. Keep working, and do not give up—especially not on yourself. Working out can not only decrease stress, but teaches you that you can excel beyond the limitations you have set for yourself. It builds your body and mind into a sharper tool, and knowing and feeling that does wonders for your self-esteem. Switching gears from “I can’t” to “I can and I will” is an unbelievable change of perspective, and fully believing that allows you to overcome what you once thought was impossible. We know corporate retreats are a great way to increase morale and team build. Unfortunately, these tend to be harder to put together and happen infrequently. However, a pickup basketball game or company baseball game can be done fairly easily and can lead to similar results. 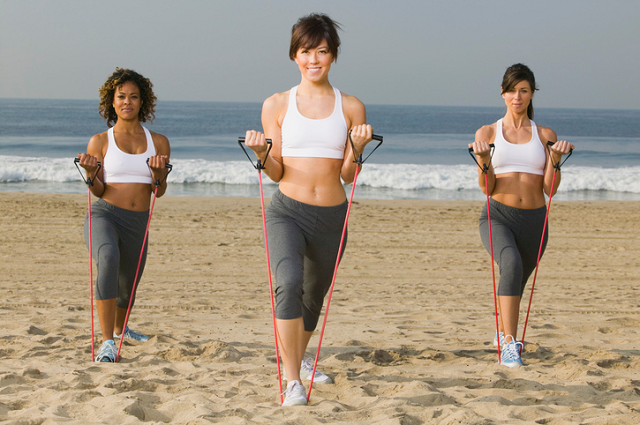 Plus, unlike some retreats, they are a great and fun way to exercise and light the fire in your belly! Having a regular commitment outside the office can be incredibly necessary. Just as you can burn out from over-exercise, you can hit a point of diminishing returns if you stay much longer than eight hours at the office. Scheduled or spontaneous workout time can help you make the most of your work time by keeping you aware that when it is quitting time, it is really quitting time. And it is comforting to know that even if you are not at work, you are building a more focused, more productive you. Doing it with co-workers has the added benefit of bringing everyone together and maybe even solving a few problems on the court! Remember, this advice is not about getting bikini-ready or becoming an Adonis. It is about getting in shape, inside and out, to tackle the most important challenges. It is about creating patterns in your life that bring about the best you possible. After all, the politicians and celebrities above are not fictional characters. They are real people who have seen real results, and that can be you too! Give your body the attention it deserves, and your professional life will follow suit. If you want to build a strong career, you will need the strength to build it.